I have had Active for over a year now at my home which I just sold. I signed a 2 year agreement and my sales person told me if I sold my home and couldn"t transfer my service I would not owe any fees. Well I just sold my home. I moved with my fiancé and we also have Active at his home, so clearly I had nowhere to transfer the service to.. spoke to management and they asked I pay a $420 early termination fee which wasn"t stated in my contract. I never gave them permission to take that fee from my account and today $420 was drafted from my account without my permission. Also on 3/19 after I asked to cancel my service they also drafted the $70 monthly payment. I have called left a voicemail for the manager and sent an email with no reply. I do not recommend doing business with this company. They obviously don"t care about their customers, because they just lost 2 due to their customer service. I have never dealt with a company like this. I will be disputing the charge to my account also since I never authorized it! I had a very good experience, and would recommend Active Pest Control to everyone. Chris provides us with excellent customer service. Active has been proactive in responding to all concerns when needed. Matthew is the best! He is courteous and remembers his clients. If you ask him a question, he is informative and respectful. I am glad I found Active Pest Control. Active Pest Control has taken care of my pest needs.I have not had any problems. Thanks! Active Pest Control was professional and did exactly what was asked . The were timely and easy to work with. I would recomend Active Pest Control to any who need this kind of service. Very polite, punctual, and efficient technicians. My service person came to the door, introduced himself, told me about the things that he was so and how it would help protect me house and yard. He was very nice and polite and I really appreciate that. I have the proactive service and have no issues inside the home. Chris is an amazing technician. He is always happy, considerate and helpful. Everyone I speak with it to schedule appointments are very nice and professional. I always recommend Active and Chris. Very pleased and good customer service. best service possible. very satisfied. Great company! Not your ordinary pest company. It is a revolving service that protects you over time! Ask for Eric he’s the best! Hi this is Nancy White with Skipper John's of Perry we have been with Active Peat Control for years our service technician is always polite and services our restaurant with great care so I would recommend there service to everyone you want be disappointed Nancy White. Simply the best!! on all levels, they explain everything in an understandable way, communicate quickly when contacted, and are friendly and very thorough in thier inspections and application of services. Active does excellent work. I recommend them highly. They do what they say thanks active. So far I can't complain. . Personnel are always pleasant to talk with and eager to answer questions. The technicians get their job done and do it well. It’s always nice to get a reminder call too. Don't leave sign in our yard please. Active pest control offers a great service. I'm a contractor and need termite pre-treatments prior to pouring the concrete slab at a moment's notice, they always come through. I also use their services for my personal home and would recommend them to anyone. Exceptional service. He always tells me that if I notice anything, just call and he will come back. I have not had to call for anything. Thank you!!!! Responds to my specific needs upon request! Provides detailed information to help customers understand; and call to schedule appointment...great customer service 🤗. 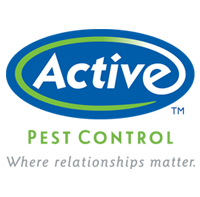 I have had Active Pest Control for almost 8 years and i have been very pleased with them. I would recommend them for you pest control needs. Active has provided me good service throughout the years. I don't remember when I started with them, but they have always been attentive to my pest control needs and I am very satisfied with their service. Always call and let you know when coming. Also call when finished to see if you have any questions. Very dependable!! Technician was professional and work was done as promised.